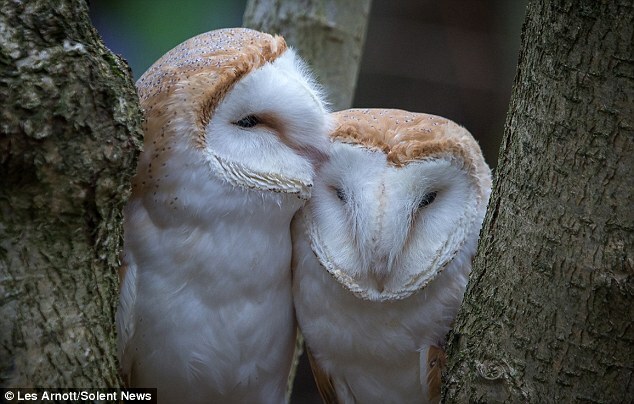 A pair of barn owls have been snapped sharing a kiss before snuggling together in the fork of a tree. The birds stayed close to each other as they preened, 'kissed' and flew together in woodland in Lea Marston, Warwickshire. 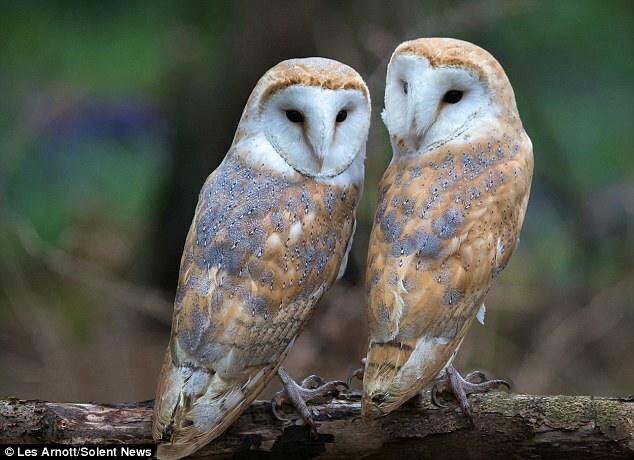 The barn owls, who found a spot in the trees where they began showing their affections to each other, are not a mating pair but sisters. The moment was captured by Leslie Arnott. 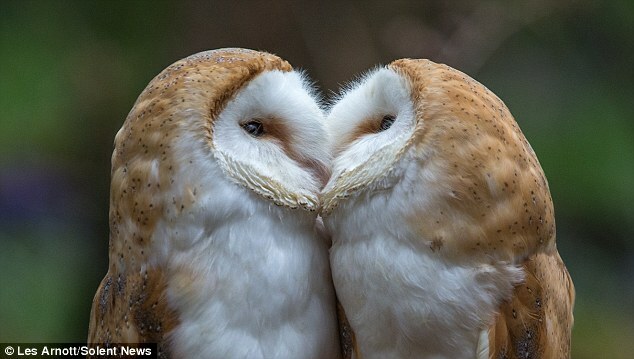 'They are quite hard conditions in the dark woodland and the pair flew for a while before sharing their special moment.' said Leslie. 'They started rubbing heads and getting quite affectionate. Then came the moment they appeared to kiss each other. 'They 'kissed' twice. 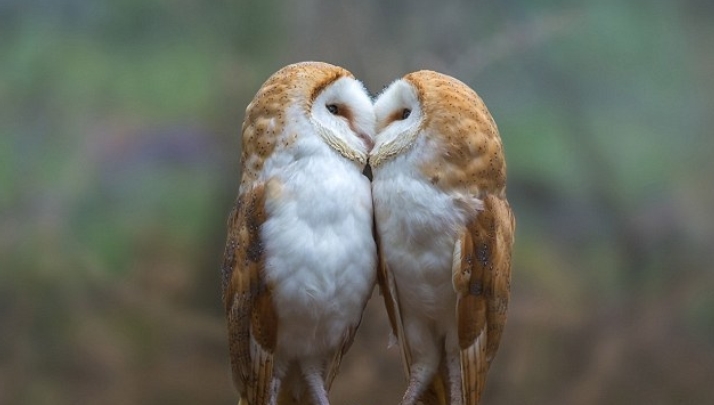 'They certainly looked like they tried to kiss but I guess we will never know for sure. 'These owls are very affectionate towards each other and work well together however they are not a breeding pair they are actually sisters. 'They continued their tender behaviour towards one another for around three minutes but the kissing happened twice within that period. 'It was luck as much as skill to catch the split second moment and I'm very glad I did.' said photographer. 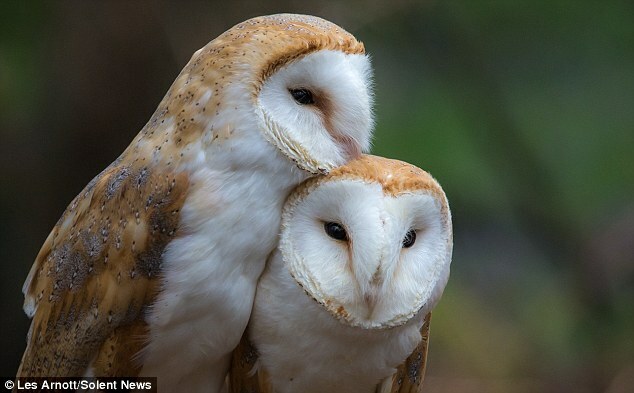 Responses to "Adorable Barn Owls Were Spotted Sharing A Tender Moment "